The Opening Bell Trade: Long the Dip or Short the Pop? 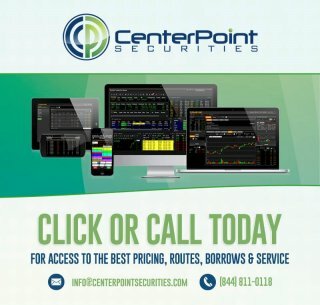 This article is to dissect the tough decision at the open on whether you should be looking to looking to buy the first dip on a stock that’s gapped up or short the first pop. It is important to understand that we generally develop a certain type of bias, be it a correct one or an incorrect one, before the trade even occurs either from our own analysis, what the general public or market sentiment is, from whatever CNBC says, etc… but this will focus on one thing and that is the action at the open and nothing else. I want to use my MRO loss at the open on Friday 1/22/16 as an example of this. 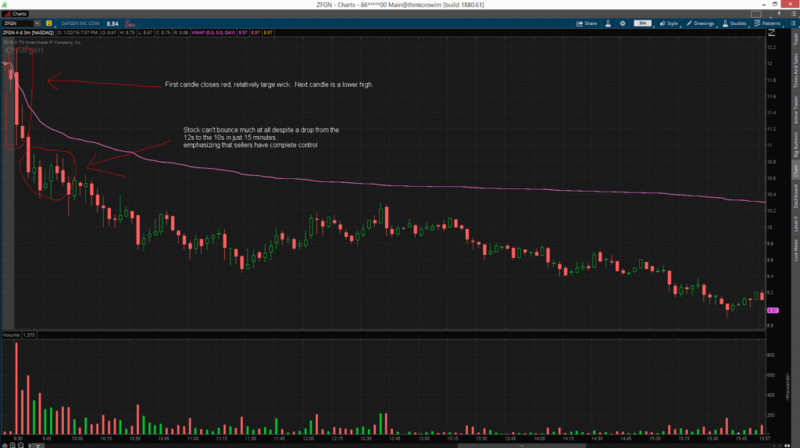 I made the [wrong] decision to go long at the open and upon reviewing the trade I can easily see why I should have went short. I developed a long bias because the sentiment on oil seemed to reverse from bearish to bullish at last for Friday with everyone and their mother touting oil and oil related stocks and indeed oil was bouncing [and holding it’s gap up] for the most part that day. So this lead me to believe that oil companies such as MRO would follow suit and at worse just gap up and go nowhere. Instead MRO faded 2 bucks or – 20% off its highs for the day at one point, something I totally didn’t expect, which goes to show you that no matter what, the only thing you should trust is the actual price action of the stock because that’s the only thing that’s not really subjective unlike the opinions of CNBC or someone’s twitter feed. 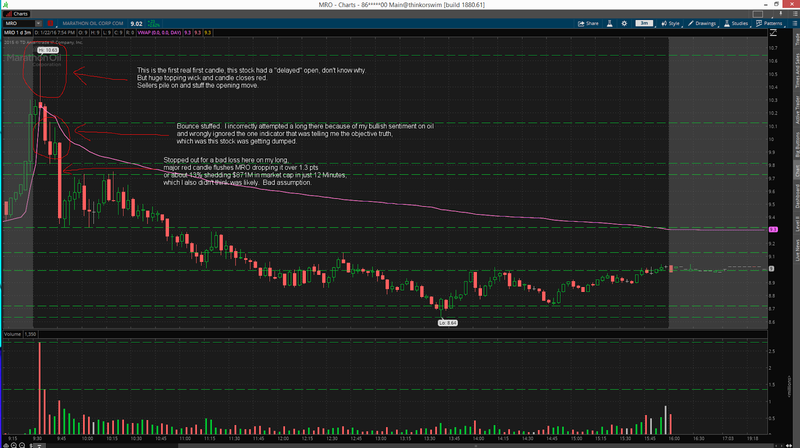 Let’s keep it simple, MRO was a short because the first 3 minute candle closed red and had a large topping wick. This is a clear tell-tale sign that the sellers piled on and sold into the first move and the first attempted “bounce” was also stuffed and led to a lower high. Did those sellers give a damn about what CNBC said or even the fact that oil was holding it’s gap? Nope. As you can see the only thing you can truly trust is what’s in front you, not what you read, not what you heard, and not even your own personal opinions. What you see is what you see and that’s what it is, and we have to see things objectively as a trader to correctly analyze and made the right decisions. Now my loss here was amplified due to liquidity issues and not getting filled at my stop out which meant I had inappropriate sizing but in truth I wanted to take a step back to understand that I never should have been on the wrong side of the trade to begin with so therefore I wouldn’t be in the situation where I’d have to dump a large long position in a stock that’s dropping like a rock with no bids for me to sell into. 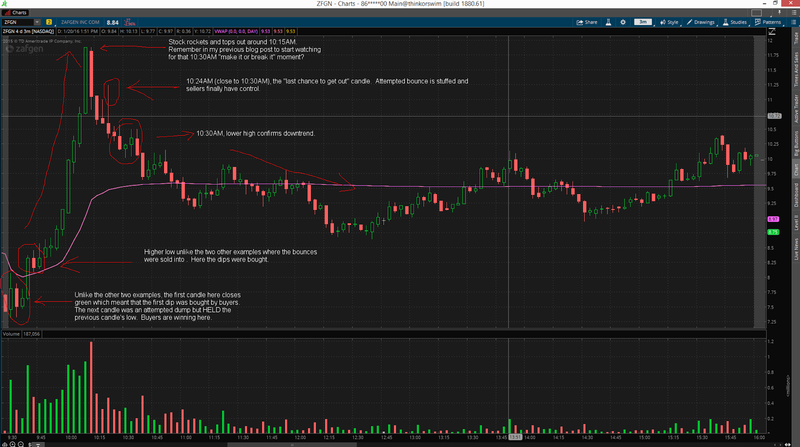 Here you can see the same setup, stock attempts a move up at the bell and gets sold into and then made lower highs. I also longed this but got filled on the stop out fully and was able to get short and I made good money on this trade. But again I should have never went long to begin with and I would have been up nicely on the short with a better entry and at a higher price. Now is this ALWAYS the case? Of course not, there’s bound to be exceptions to these examples. But this is the stock market, nothing is absolute, however we should always take the higher percentage trade to maximize our chances of profiting. Even if a strategy yields a 99.9% success rate, there’s still a chance you run into that 0.01% where it doesn’t work out, just be mentally prepared for it and don’t throw a fit and go on tilt if you implement a seemingly “impossible to lose” strategy and lose money once in awhile. Again this article is to serve as a reminder to myself to learn from my mistakes. My strategy at the open has proven to be extremely profitable in all my years of trading (on average I win on 90%+ of my trades at the open) but even then the best strategies will still need tweaking from time to time as the market conditions are always dynamic. Hope this also helps others who feel like they could benefit from this. I may make a video on this in the future to reiterate how important this is.